Time, convenience and security. We'd like more on a daily basis, but ESPECIALLY during tax season. With TaxAct® Professional's Client Xchange all that and more is now within immediate reach for you and your clients. Client Xchange is a secure portal website that enables you and your clients to easily and safely exchange tax documents. Your website can be personalized with your practice name and a logo (nothing will say "TaxAct") and you can set up clients' filing cabinets with a standard set of folders. Client Xchange allows you and your clients to upload and download sensitive information without worry. Data is encrypted and stored on TaxAct's secure servers. 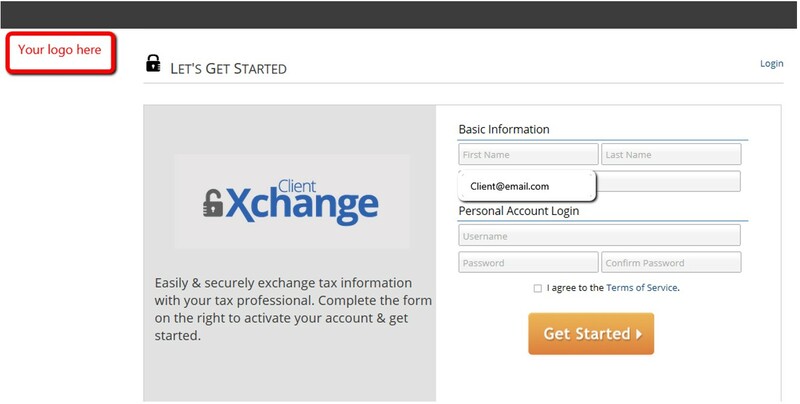 You'll access Client Xchange by signing in to your secure TaxAct Account. You'll email clients an invitation from Client Xchange that contains a unique link to activate and access their account. Your clients will enjoy the convenience of delivering encrypted W-2s, 1099s, statements, spreadsheets and photos of receipts to you from the comfort of home on a PC, tablet, or smartphone. They will appreciate the drive time and gas they save. Clients will also appreciate how easy your website is to navigate and how fast it is to upload any type of file and download forms you need them to review or sign. (And hopefully you'll also receive the signed forms sooner!) They'll receive an email notification whenever you upload a file. You'll gain new workflow efficiencies and time savings. Client Xchange expedites the exchange of information with clients, allowing you to finish and file returns faster. Additionally, you can opt to receive email notifications when clients upload files. Upload client organizers, forms for signature, instruction letters, invoices and final versions of tax returns – making paper and postage optional. If your practice is going green or if you usually scan paper files, now all you have to do is save clients' files to a local drive or in TaxAct Enterprise Edition's Document Manager. If your clients upload PDFs of last year's tax return or a CSV file of stock transactions, remember you can import them directly into TaxAct Preparer's Editions. If you are an Enterprise Edition customer who networks online (your data is saved on TaxAct's secure servers), you will enjoy an additional convenience. TaxAct will automatically import your Client Manager list into Client Xchange so you can invite clients in just a few clicks. The annual fee for TaxAct Professional Client Xchange includes unlimited storage and an unlimited number of preparers and clients. Learn more about pricing and access dates here.